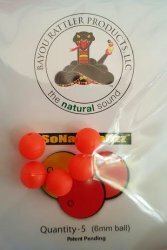 Bayou Rattler Products, LLC....These 6mm plastic beads are hollow and contain little metal rattles inside them, making a swooshing rattle noise. They have a hole straight through to allow for easy wiring in between streamer segments. Regular packs contain 5 beads, the larger pack has 15..These beads will not disappoint..